Conditional Edit Access to Datasets and Users Maps in the Category. (NOTE: Automatic Permission to use Category Dataset's non-configurable Data Sources are NOT granted and must be given manually by the Admin before the Power User is able to Edit a Dataset). Based on the actual contents of the Category, Power User ALSO must also inherit or be granted the additional Privileges and Permissions as noted in the sections that follow. In the Privileges section click [+ Privilege to User]. The pop-up opens. To have the ability to edit a Dataset or User Map in this Category, a user must be given a Permission to use the configurable Data Source (SQL / Plugin) used by the respective Dataset. In the Data Source field click the Gear icon. You are redirected to the Data Source Editor. At the top right corner of the screen click Permissions. In the opened pop-up click [+ New User to Data Source] and select the User from the drop-down list. Since the Power User is granted Conditional Edit Access to Category's Datasets, once the Power User has Permission to Use the Dataset's Configurable Data Source, the Power User can see all of the Dataset's data, so no entry in the User Map is required for this Power User. If there are elements in this Category that are sourced from Datasets that are not in this Category, the Admin must grant the Power User at least View Access to the source Dataset before the Power User will be able to Edit the element. If elements, Datasets or User Maps in the Category are sourced from one or more non-configuable Data Sources, the Power User must be granted the respective Privilege and/or source element access Permissions to make it possible to edit the related object. The related requirements are discussed below. Power User must have View access to the source Metric(s) given at User Editor > Elements tab > [+ Element access to User]. Power User are not required to have View access to the source Report(s). This is an exception to the source element rule. No Privilege is required; this is automatically granted to each Power User. 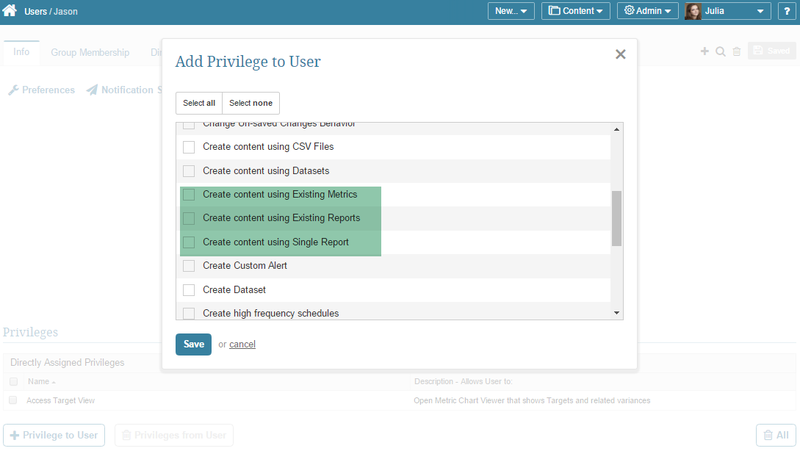 Power User must have View Access to the source Metric from which it is aggregated. The Power User must have Permission to View all ource elements of any Multi-Metrics in this Category. If Edit Access is granted to Power User for a Category that is "nested" (i.e., has one or more child Category), user receives automatic access to Data Sources used by elements in that Category but NOT to the Data Sources used by elements in its Child Categories. SOLUTION: Admin must go to the User Editor > Power User tab to manually grant Permission to use Data Sources used by elements in any related Child Categories. Alternatively, Permission may be granted on the Data Source Editor > Permissions. If elements in the Category are dimensioned, the Power User must be granted access to at least one Dimension Value of the Dimension associated with each element from the Category or to the whole Dimension.